Fire action signage is essential to clearly communicate to everyone on your premises what action to take in the event of a fire. These signs provide clearly-defined instructions in easy to follow steps of what to do when a fire breaks out. In addition to fire action signs, fire assembly point signs and fire exit signs should be used. A range of sign fixings is available with which to secure your signs. These are premium aluminium signs and are ideal for hotels, executive suites and reception areas. They contain space for relevant information to be written on or, for a more professional finish, can be printed on. Information to be included on the sign is, for example; the telephone number for calling the local fire brigade, the nearest emergency exit route and the fire assembly point to report to. Nite-Glo photoluminescent fire action signs are ideal for areas where fire action signs need to be seen in the dark or low light areas. Made from an environmentally-friendly polyester film, the signs appear white in daylight and glow brightly when there is no light. This type of fire action sign is particularly useful as they can be seen through thick smoke and in the event of a power cut. The material options for the Nite-Glo fire action signs are polyester or rigid plastic, both of which are suitable for indoor use only. What’s more, they are non-reflective, so they won’t be obscured by emergency lighting. If your photoluminescent fire action notices are to be placed outdoors, then Xtra-Glo signs should be used. Again these signs are available in polyester or rigid plastic. Both are compliant with Photoluminsecent Safety Products Association (PSPA) Class B, the German Institute for Standardization (DIN), the International Maritime Organization (IMO) and British Standards requirements. 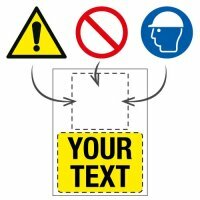 Check out our other safety signs to ensure that areas of hazard in the workplace are highlighted clearly. See our guide to safety signs materials for more information on these and the other materials available. If you have areas that are prone to vandalism, then a vandal-resistant fire action sign should be used. 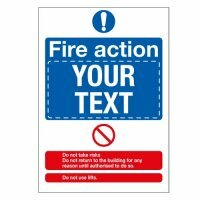 This will not only safeguard the integrity of your signs, but could potentially save lives – if fire action signage is not clear due to vandalism, employees and visitors may not be able to read the instructions and will not be able to take the correct action in the event of an emergency. Use our Security Fixing Kit for securing your vandal-resistant signs. They include tamperproof screws that require a special tool to undo the screws. However, if you have a flat, clean, dry surface, then opt for signs with self-adhesive backing. These are quick and easy to secure in place – simply peel off the protective backing.